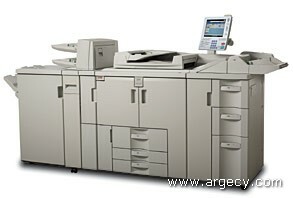 Looking for IBM Infoprint 2190 & 2210 Parts? Leasing Available from $54.15 per month! The flexibility of the new Infoprint 2190 and 2210 products provides the capability to create professional-quality documents, even with complex multitask composition, at speeds up to 90, and 110 impressions per minute (ipm)1. Integrated color scanner and scan to e-mail. 1 Exact print speed varies depending on document complexity, system configuration, software application, driver, and printer state. The Infoprint- 2190 and 2210 monochrome multifunction production devices are full-function, printer and duplication systems that effectively combine a high-volume production printer with copier and multifunction capabilities. Available in two versions, these cut-sheet multifunction production devices are cost-efficient, easy-to-use, print-on-demand solutions that have print speeds up to 90, and 110 ipm1. The printers have excellent print quality with 600 dpi Intelligent Printer Data Stream (IPDS) and selectable 600- or 1200 dpi for PCL, PostScript, RPCS, and PDF. The printers include a finisher and can be configured with a high capacity feeder, a z-fold unit and a saddle stitch booklet maker. Other options include security features, a Multi-Bypass Tray, IPDS, PostScript, and a Two-Cover Interposer unit. These new systems provide a perfect blend of advanced technology, exceptional reliability, and extensive finishing options that can handle a variety of work with ease. Perfect for any environment, from Central Reproduction Departments to Data Centers and Print for Pay, the new Infoprint systems provide efficient workflow with superior dependability. The Infoprint 2190 and 2210 can help transform your business to become more competitive and win in the marketplace. In addition to duplex printing at 90 ipm for Infoprint 2190, and 110 ipm for Infoprint 2210, the printers have an 80 IPM integrated color networked scanner that supports digital copying. Controller: The Infoprint 2190 and 2210 have controllers that include512 MB of memory and has an onboard 10/100Mb TX Ethernet attachment and a USB attachment. An optional Gigabit Ethernet attachment is available. Hard drive: Two 160 GB hard drives are standard with these printers. Full-Color Display: Infoprint 2190 and 2210 have a full-color 10.4 inch touchscreen TFT LCD Display. Paper handling: The Infoprint 2190 and 2210 include three input drawers that provide a 3,000-sheet input capacity. Optional High Capacity Feeders with three drawers are available. An optional Multi-Bypass tray is available which increases the maximum input capacity to 8,050 sheets. Custom paper sizes are supported in trays 1, 4, 5 and 6 in mm settings only. Custom size is 139 mm x 210 mm (LEF) minimum and 305 mm x 439 mm(SEF) maximum. A Two-Tray Cover Interposer tray option is available. It allows media such as front and back covers to be inserted after the print media has-been through the fuser. Each inserter tray has a 200-sheet capacity (80gsm, 20 lb). These high capacity feeders are for A4 and Letter-sized media. The high capacity feeder ordered determines the initial setting (A4 or letter-size). This feature has three trays. Trays 4 and 5 have 1,000-sheet capacity each and tray 6 has 2,550-sheet capacity. IBM Field Engineering service is required to change from A4 to letter-size, or from letter to A4. Only have one High Capacity Feeder (one of #4520, 4521, 4522, 4523, 4524, 4525, 4527, 4528) can be installed per printer. These high capacity feeders are for A3 and Ledger-sized media. The high capacity feeder ordered determines the initial setting (A3 or ledger). This feature has three trays for 4,000-sheet capacity. Trays 4 and 6 have 1,000-sheet capacity each and tray 5 has a 2,000-sheet capacity. IBM Field Engineering service is required to change from A3 to ledger-size, or ledger to A3. This tray provides an additional media input. It is often used for paper larger than that in the High Capacity Feeders. This feature requires the optional A4/letter (#4520, 4521, and 4524 4525)or A3/Ledger (#4522, 4523, 4527, 4528) High Capacity Feeder. The Multi-Bypass tray has a 500-sheet capacity and supports up to A3 or 12x18 inch media with the A4 HCF or up to A3 or 13 x 18 inch media with the A3 HCF. This option supports large size media including A3/ 11 x 17-inch media. It replaces the standard tray 1 (tandem tray) which requires an IBM Field Engineer to re-install. This tray is supported in tray 1 only and has a capacity of 1,000 sheets. The Large Paper Size Tray requires IBM Field Engineer to both install this feature and to switch back to the original tray. Media supported in this tray include A3 SEF, B4 SEF, A4 SEF, A4 LEF, 11x 17 inch SEF, Letter SEF, Letter LEF, Legal SEF, and up to 305 x 439mm custom size. Finishers: The 3,000 sheet Finisher is standard on all printers. This finisher has a proof bin with 500-sheet capacity (A4/Letter) and a shift bin with 3,000-sheet capacity (A4/Letter). It has shift (offset)capability and a stapler that can staple together up to 100 sheets. Jobs cannot be stapled and shifted. If a job requests both of these, it will be stapled only. A Stack Aligner is included that improves stacking. Optional hole-punching kits are also available. Only one punch kit may be installed at a time and it requires an IBM Field Engineer to install or change the kits. Punch jobs can go to the shift tray or proof tray. This option supports 2-hole and 3-hole punching in the U.S. format. This option supports 2-hole and 4-hole punching in the European format. This option supports Scandinavia 4-hole punching. This booklet maker has saddle stitching capabilities for up to 15sheets per booklet. A separate output bin can stack from 10-30 finished booklets depending on size. Print quality: Infoprint 2190 and 2210 offer high-quality print resolution of up to 1200 x 1200 dpi. For AFP-/IPDS, input resolution can be 240 dpi, 300 dpi, 600 dpi, or auto. Output is generated at 600 dpi and printed at 1200 dpi. Print area: Both printers support a printable area of within 4 mm of the edge on all sides for IPDS and PCL/PostScript data streams. Edge-to-edge mode allows printing to within 2 mm leading edge and 0 mm on all other edges of the media. The only exception is 12 x 18 inch media which is printed at an A3 size. Maximum monthly usage: The maximum monthly usage for the Infoprint 2190 is 1,200,000 impressions. The maximum monthly usage for the Infoprint 2210 is 1,500,000 impressions. IBM does not recommend printing to this monthly maximum on a consistent basis. Color Scan Capability: Infoprint 2190 and 2210 printers come standard with a digital copier. While the copier is extremely powerful, it is still easy to use. All copier functions are accessed through the large, user-friendly touch panel. Originals are scanned in and a digital representation of the original is created that can be printed. Simplex and duplex originals (both color and black&white) can be copied by either placing them on the scanner glass or utilizing the ARDF (Auto Reverse Document Feeder). The ARDF is a fast and versatile scan feeder, capable of handling up to 100 sheets at a time (81.4 gsm,22 lb). The ARDF can feed pages up to 80 ppm (8.5 x 11 inch or A4). The ARDF can handle a wide variety of paper sizes from 5.5 x 8.5 inch to 11x 17 inch ledger or B6 to A3. Up to A3 or 12 x 18 inch originals can be scanned on the glass. The ARDF can scan mixed paper sizes and weights in the same stack. The ARDF is also capable of automatic paper size selection and automatic paper reduction/enlargement on a sheet-by-sheet basis. The copier also includes an integrated document server and editor. The document server stores up to 250 jobs or up to 5,000 pages. The document server allows the user to scan originals, save the documents onto the built-in hard drive, scan to e-mail server and print saved documents. All of the available finishing options are available when printing a stored document. Documents can be protected with user IDs and passwords. The document server also allows the user to print a sample copy, insuring that the full print job will be output correctly. Overall, the Infoprint 2190 and 2210 copier functions are full-featured and easy to use. The combination of a high-speed digital scanner, a high-quality printer, and exceptional function creates an extremely effective tool for any business. Ordering Instructions: Two features must always be ordered with each Infoprint 2190 and 2210. InfoPrint 2492 Perfect Binder (InfoPrint 2492-001 Perf Binder). The InfoPrint 2492 Perfect Binder attaches to the InfoPrint 2190, 2210, and 2235 printers. For 100-sheet (200 pages) booklets with three-edge trimming, the speed of the InfoPrint 2492 Binder is approximately 20 booklets per hour. Glue is not included with the Perfect Binder. The glue necessary to bind books must be ordered as a supply item. Detailed information is in the Supplies section of this letter. The following table shows the line cord feature number and the correct specify code required to order the InfoPrint 2492 Perfect Binder. Both the line cord feature number and the correct specify code is required on all orders. This binder is intended for professional document preparation. The following features are for the machine type 2492, Model 001. The InfoPrint 2492 Perfect Binder is supported by PCL, PostScript, RPCS, and PDF. Yield: Approximately 1,300 bound books at 100 pages per book per 5 kg (1 box) glue. These products use the security and auditability features of the host hardware, software, or application software. Letter High Capacity Feeder (#4520/4521):This high capacity feeder, also referred to as a Large Capacity Input Tray (LCIT), is initially preset to Letter-size. The feeder has 3 trays for 4,550-sheet capacity. Trays 4 and 5 have1,000-sheet capacity each and tray 6 has 2,550-sheet capacity. A4 High Capacity Feeder (#4524/4525): This high capacity feeder, also referred to as a Large Capacity Input Tray (LCIT), is initially preset to A4 size. This feature has 3 trays for 4,550-sheet capacity. Trays 4 and 5 have1,000-sheet capacity each and tray 6 has 2,550-sheet capacity. Ledger High Capacity Feeder (#4522/4523): This high capacity feeder, also referred to as a Large Capacity Input Tray (LCIT), is initially preset to Ledger size. This feature has 3 trays for 4,000-sheet capacity. Trays 4 and 6 have1,000-sheet capacity each and tray 5 has 2,000-sheet capacity. A3 High Capacity Feeder (#4527/4528): This high capacity feeder, also referred to as a Large Capacity Input Tray (LCIT), is initially preset to A3 size. This fefont-family: courier new,courier,monospace;ature has 3 trays for 4,000-sheet capacity. Trays 4 and 6 have1,000-sheet capacity each and tray 5 has 2,000-sheet capacity. 3,000 Sheet Finisher (#4610):This Finisher must be ordered for each Infoprint 2190 or 2210. A Stack Aligner is included that improves stacking. Optional hole-punching kits are also available. Only one punch kit may be installed at a time and it requires a CE to install or change the kits. Punch jobs can go to the shift tray or proof tray. Installation Services (#4900):This feature must be ordered for each Infoprint 2190 or 2210. The feature provides IBM Field Engineering service to install the printer. Multi-Bypass Tray (#4502/4503):This option supports large size media up to A3 or 13 x 18 inch and has a 500-sheet capacity. This option supports large size media including A3 or 11 x 17 inch media and replaces the standard tray 1 (tandem tray). This tray has a capacity of 1,000 sheets. Media supported in this tray include A3 SEF,B4 SEF, A4 SEF, A4 LEF, 11 x 17inch SEF, Letter SEF, Letter LEF, Legal SEF, and up to 305 x 439 mm custom size. Two-Tray Cover Interposer (#4600/4601):This option allows media, such as covers to be inserted into the print job. The media is inserted after fusing. Saddle stitch Booklet Finisher (#4612/4613): This booklet maker has saddle stitching capabilities for up to 15 sheets per booklet. A separate output bin can stack from 10-30 finished booklets depending on size. 2/3-Hole Punch Kit for the 3,000 Sheet Finisher (#4620/4621):This option supports 2-hole and 3-hole punching in the U.S. format. Only one of the hole punch kits can be installed at a time although multiple hole punch kits can be ordered. Punch Kits can only be removed and installed by IBM Field Engineering. 2/4-Hole Punch Kit for the 3,000 Sheet Finisher (#4622/4623): This option supports 2-hole and 4-hole punching in the European and Japanese format. 4-Hole Punch Kit for the 3,000 sheet Finisher (#4624/4625):This option supports Scandinavia 4-hole punching. PostScript (#4820/4821): This feature provides PostScript and PDF. IPDS (#4822/4823):This feature provides IPDS. Gigabit Ethernet (#4180, 4181):This feature is required to attach to an Ethernet network. This attachment provides 1000 BaseT Ethernet data transfer. InfoPrint 2190, 2210, or 2235 with firmware level 3.5, or above. Binding mode - holes are punched in the media and the rings are inserted to make a bound document. Punching mode - holes are punched in the media but no rings are added to the punched holes. No rings are included with this binder. Rings must be ordered separately as supply items. Document covers or inserts can be included in a document by feeding them from the two-tray cover interposer (feature number 4600 or 4601) on an InfoPrint 2190, 2210, or 2235. Specify feature number 9644 for the letter-size (Americas) version of this binder. A line cord must be ordered with the ring binder. Refer to the table below for information required to order the line cord. Ring cartridges are used to hold a supply of rings (combs). A cartridge loaded with rings is used to load rings into the ring binder. Rings can be preloaded into cartridges for quick replenishment. Each cartridge holds 75 rings. One cartridge is shipped with each ring binder. The purpose of this feature is to provide additional cartridges. The ring opener is a tool used to easily open a ring booklet and then insert the rings back into the booklet. This is useful if it is desired to change a few pages in a booklet. The following punch kits are now available on the InfoPrint 2235 3,000-Sheet Finisher. Previously, these kits were available only on the InfoPrint 2190 and 2210. The punch kits require an InfoPrint 2235 with firmware level 3.5, or above. The maximum print speed on the InfoPrint 2235 is 110 ipm when hole punching is used. IPDS now supports the saddlestitch booklet maker on the InfoPrint 2190, 2210, and 2235. The InfoPrint 2492 Perfect Binder and the InfoPrint 2494 Ring Binder cannot coexist on the same InfoPrint 2190, 2210, or 2235 printer. Neither of these binders can be installed on an InfoPrint 2190, 2210, or 2235 that has the saddlestitch booklet maker finisher (feature number 4612 or 4613). Also, the copy connect kit (feature number 4150 or 4151) on the InfoPrint 2190, 2210, and 2235 is not compatible with either the InfoPrint 2494 Ring Binder or the InfoPrint 2492 Perfect Binder. The following features are for the InfoPrint 2235 (machine type 2707, Model 003). Model conversions: No model conversions are available. The InfoPrint 2494 Ring Binder is supported by PostScript, PCL, PDF, and RPCS. Rings: There are 75 rings (combs) per box, and 5 boxes per carton. The part number is one carton (375 rings). Z-Fold Unit (#4530, 4531): The Z-folding unit makes two parallel folds on the paper, one of which faces in and the other facing out. Thus, the paper is folded like the letter "Z". Two of the three folded sections of paper will be of equal size. The distance from the edge of the z-folded sheet to the folded sections is variable within the ranges below. This unit requires a separate power outlet. This three-pass data overwrite operation is designed to reduce risk of anyone trying to access and reconstruct confidential information. The only way to turn this feature off is by physically removing this feature from the printer. Copy Connect Kit(#4150, 4151):This feature provides the capability to cable two printers together so a copy job can be split between the two copiers. Copy Data Security Unit(#4730, 4731): If a document containing an embedded pattern for unauthorized copy is copied, protected pages are grayed out in the copy by the copy data security unit. Without this optional unit, the embedded pattern becomes conspicuous in the copy, showing that the copy is unauthorized. The RPCS printer driver enables the data security pattern for printing documents with the embedded pattern of hidden text regardless of the presence of the copy data security unit. File Format Converter(#4734, 4735):This feature provides the capability to download documents from the Document Server (hard drive)stored by copier and printer functions. Without this feature, only scan data can be downloaded. Paper Weights (base system): 52 - 216 gsm, Bond 16 - 40 lbs., Cover 50 - 80 lbs., Index 90 - 110 lbs. 199 gsm/110 lb. Index max. No Z-folding: 60 gsm - 150 gsm/16 lb - 40 lb Bond; 199 gsm/110 lb Index max. ; 216 gsm/80 lb Cover max. The language and associated code page support below is based on the current SAA- Core Interchange Resident Code Page Support and 4028Compatibility Resident Code Page Set. Only EBCDIC code pages are listed. IBM OS/400 ASCII Printer Support: Infoprint 2190 and 2210 are supported as an ASCII (PCL) printer via a Workstation Customization Object under the Host Print Transform (HPT) facility. HPT transforms the AFPDS data stream to ASCII for printing to iSeries ASCII printers. OS/400 TCP/IP Line Printer Requester (LPR) and Line Printer Daemon (LPD), also known as remote output queue. Cable orders: Network interface cables not supplied. established with an average coverage of 6%. An "impression" is defined as one printed side of a A4/Letter sheet. A duplex sheet would consist of two impressions. The approximate average yields are not a warranty or guarantee of minimum life, and are provided to assist in initial supplies planning. Actual usage should be used to establish the supply's life in the end-user-s application. Many factors (for example, print coverage per page, machine settings, paper type and size, and environmental conditions)can affect supply life. The prices provided in this announcement are suggested retail prices for the U.S. only and are provided for your information only. Dealer prices may vary, and prices may also vary by country. Prices are subject to change without notice. For additional information and current prices, contact your local IBM representative. IPDS, SP, AFP, i5/OS, iSeries, and Perform are trademarks of International Business Machines Corporation in the United States or other countries or both. Infoprint, DPI, AIX, OS/400, z/OS, SAA, and GDDM are registered trademarks of International Business Machines Corporation in the United States or other countries or both. UNIX is a registered trademark of the Open Company in the United States and other countries. Linux is a trademark of Linus Torvalds in the United States, other countries or both.